When you first see a John Hammer painting, it’s normally the character in the piece that draws you in. After looking at it for a bit longer, you may realize it’s the bright, unconventional colors that makes the painting special. Hammer is a Pop Impressionist. His portraits of real and fictitious people run the gamut from Woody Guthrie, Will Rogers, Maya Angelou and Michelle Obama to Batman, Darth Vader, Steve Zissou from The Life Aquatic and “The Dude” from The Big Lebowski. He’s even painted exotic versions of the Golden Driller and the Blue Whale of Catoosa – both northeast Oklahoma roadside landmarks. His work is bold and bright. Some of his characters’ rosy cheeks are colored with bright blue and green hues. Skin tones are purple. The highlights and wrinkles in faces are purple and white. But, when you see a Hammer character, you know exactly who it is. After a field trip to a museum in second grade, Hammer was motivated to begin sketching. He first drew black and white pictures of horses, his grandparents, and characters from MAD and Cracked magazines. In high school, he drew pictures of his favorite rock band, KISS, which he sold to his friends for fifty cents apiece. He kept on drawing and progressed through college ultimately graduating with a commercial art degree from the OSU Institute of Technology (OSUIT) in Okmulgee. Hammer opened The Hammer Studio and began working prolifically. 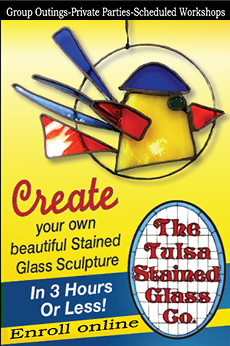 His first showing was a 5×5 exhibition at the Tulsa Artists’ Coalition (TAC) Gallery in the Brady District in Tulsa. While painting a portrait of Pugsley from The Addams Family television show for the exhibition, he attempted to shadow Pugsley’s face in a realistic manner. What Hammer created was a young Pugsley with green cheeks and yellow eyes … a zombie-like version of the lad. But something about it worked. It was then that he started using fantastic colors in faces … a trademark style for Hammer. Using only acrylic paint, he has now evolved to painting impressionistic abstracts with pure intense colors in Hammeresque style. He paints in both small and large format ranging from 25 square inches to 25 square feet. His work can be seen regularly on exhibit throughout the Brady Arts District and on his Facebook page at @TheHammerStudio. Other installations of his paintings include a permanent display of 30 images at OSUIT in Okmulgee, portraits of Woody Guthrie and Will Rogers at the Woody Guthrie Center in Tulsa and the Will Rogers Memorial and Museum in Claremore, and a painting of a guitar displayed in the BOK Center in downtown Tulsa. And, if you ever make it to the home of “Weird Al” Yankovic on Sunset Boulevard in Los Angeles, you will see one of Hammer’s portraits of Yankovic commemorating the 25th anniversary of the film UHF. Hammer will be painting live on First Friday at the Guthrie Green in the Brady District on November 3 and his work will be on display in November and December at The Wild Fork in Utica Square.